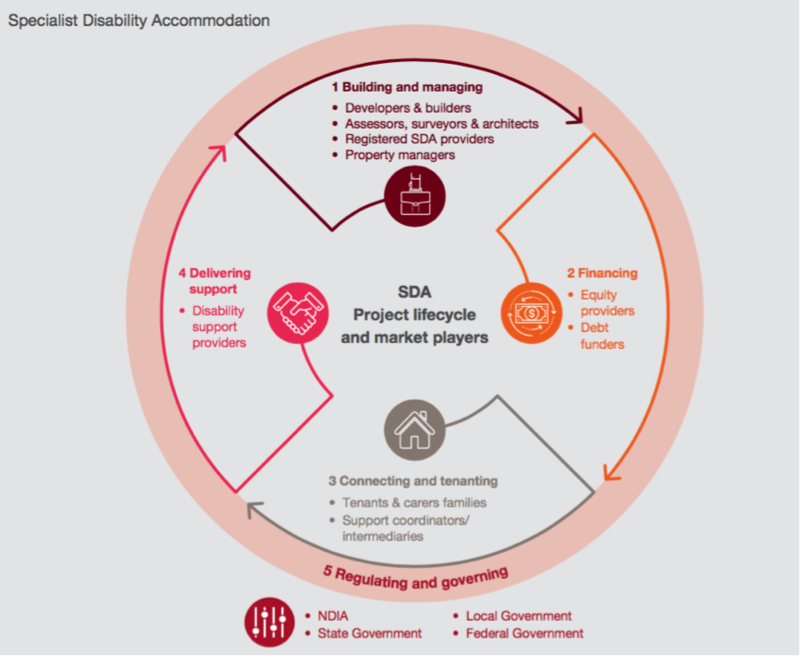 It has been almost two years since the NDIA released the detail of its funding and approach to housing, known as Specialist Disability Accommodation (SDA). Over the last 24 months, there has been a lot of talk about SDA—and increasingly— results on the ground. Despite the progress so far, big challenges remain for providers trying to deliver on the vision for the SDA market. And new challenges are emerging as more providers are finalising SDA projects. SDA construction and delivery is at a modest, but respectable, level. There are around 1,000 SDA places under contract or construction across Australia, according to Summer Foundation’s demand and supply survey. However, genuinely market-led development is much lower, consisting of only around 400 of the 1,000 places. The remaining 600 places are government-led SDA developments: the Hunter Large Residential Centre redevelopment in the Hunter (400 new SDA places), and the SA Government’s efforts to create more housing (200 new SDA places). The Summer Foundation’s study shows that there is a high level of concentration in SDA builds. Most buildings are High Physical Support or Robust (over 80%) and either a 1 or 2 person apartment or 5 bedroom group home. The take away from these findings is that providers remain highly sceptical of the lower levels design categories. This is a logical conclusion for providers to draw. Participants need to have an “extreme functional impairment” to live in SDA. They must also be unable to live in public housing or private rental. Yet the “Improved Liveability” category provides little more accessibility than the average well designed social housing dwelling. How will participants who have such low needs for specialised housing be eligible for SDA? The findings from this work also confirm that providers are finding it hard to make the pricing stack up for smaller free-standing dwellings (the 2-3 person house or townhouse). While many SDA providers and participants see this as the idea built form, the pricing often does not support the delivery of this level of accessibility. As we move to maturity in the building and managing SDA sector, there will need to be more informed and skilled consultants and Liveable Housing Assessors. Providers continue to experience errors and mistakes in building code compliance, planning approval and design errors that reflect an inexperience and thinly supplied market of experts to assist with design. Providers in regional areas are bearing the brunt of this skills shortage. With the NDIA, McKinsey and governments regularly hearing from the sector that compliance with the SDA Design Categories requires more clarification from NDIA and a dedicated training program by LHA for its assessors, hopefully, we will begin to see progress compliance and assessor training in the very near future. Delivering on the SDA policy relies almost entirely on banks and other investors coming to the table. Almost $5 billion worth of new housing is needed. A further $1.5 billion will be necessary to replace/refurbish all the current SDA stock. This will more than triple the current debt that community housing providers have on all affordable housing across Australia. That’s a huge call. Thankfully, banks are coming to the table. Most of the big 4 banks have agreed to finance SDA transactions. Although their lending levels are have initially been conservative, their risk appetite is increasing as the market matures and SDA projects have a track record on revenue and vacancies. The Commonwealth Bank is hosting the launch of a national study on SDA demand, thus demonstrating the interest and commitment of Australia’s biggest lenders to SDA. Yet smaller banks continue to be the most active lenders for SDA transactions. Bank Australia, as DSC previously reported, remains one of the biggest and most well informed supporters of SDA across the country. Community Sector Banking is also an active supporter of SDA, and is financing the recently announced SDA projects in Melbourne. Financing structures are also becoming more sophisticated. Special Purpose Vehicles are being established, more complicated head leasing arrangements are emerging, along with leases with the option to purchase at a later time. Providers and the market are moving beyond the vanilla approach of a single provider accessing debt to own SDA. These more sophisticated ownership and leasing options show that there are a variety of entities in the market, each with their own expertise and capacity to manage risk. The establishment of more complex structures demonstrates that partnerships can be highly successful. Often, they are between new players with capital (e.g. Real Estate Investment Trusts) and not for profits with long-standing expertise in working with tenants with a disability. The largest financing challenge facing the SDA market is access to equity. Large SDA transactions in the market over the last 6 months have shown that accessing debt is the easy part. The hard part is finding equity willing to take the risk of SDA projects at a price point that works within the SDA pricing. Equity from not for profits is driving many of the early transactions. Soon this will dry up. It certainly won’t reach the scale of the approximately $1 billion of equity needed to create 12,000 places of SDA. In fact, it will be a remarkable achievement if we get to 10% of this number with not for profit equity. So, where can the equity come from? Interest in the market at the moment indicates that offshore equity is likely to play a significant role. With a higher risk appetite and in search of new markets, offshore equity is much more interested in the SDA market than Australian superannuation funds. Australian super funds remain hesitant to invest on the basis of insufficient returns. This is compounded by transaction sizes that continue to be below their thresholds, even for due diligence. This may change as the market grows and superannuation funds start being presented with deals at $200m or more. Under the NDIS’s model of choice and control, providers and tenants now have to match with each other. For the first time, participants can shop around, selecting their preferred provider and dwelling. This is the area where the market is showing the least signs of maturity. In the past, few providers ever had to advertise their vacancies. Participants previously just submitted an application to a state-wide waitlist, and a decision was made in a black box. SDA providers are beginning to realise the magnitude of the challenge of connecting with NDIS participants. Finding the niche group — that 6% of NDIS participants with SDA — and building relationships is time intensive and requires a skilled practitioner with good networks. SDA providers developing new stock are experimenting with different options for engaging with participants: from employing an engagement officer internally, to partnering with a support provider with a pre-existing waiting list, through to entirely outsourcing the tenant selection process to emerging fee-for-service SDA tenant selection providers. Online platforms are emerging to help providers to make this process more efficient. For the first time, websites such as Nest (https://gonest.com.au/ ) and The Housing Hub (https://www.thehousinghub.org.au/) are giving providers the ability to market SDA properties directly to NDIS participants. These prototype platforms could be the future of connecting the market. They play a critical role in making the tenant matching process more efficient. Online platforms are providing a standardised way for participants, families and support coordinators to see what SDA and non-SDA housing is available across the market. This cuts down time and removes the inefficient process of phoning all registered SDA providers. They also help expose the wide range of SDA options, leading to participants thinking beyond the traditional 5 bedroom group home models. Both platforms are currently free for providers in selected areas. While many SDA providers bemoan the confusion and challenges associated with navigating the SDA policy, their Supported Independent Living (SIL) counterparts are attempting to disentangle their own morass of the SIL puzzle. The SIL quoting tool, released last year by the NDIA, has made the quoting process more standardised, but also more burdensome for providers. The quoting process requires a huge amount of time, for what can often seem like a lucky dip of a funding level. Participants are also feeling the effects of this standardised process. The ability for providers to provide an innovative, flexible and participant-directed support model is near impossible in the current SIL quoting process. All this affects the SDA market as well. As Brent explores in his article, the SDA-SIL relationship is critical for SDA providers. The nature of SDA-SIL relationships is emerging as one of the biggest areas of differentiation in the market. This relationship shapes the underlying essence of a property as being first and foremost either: 1) a collaboration between two SDA and SIL provider; or 2) a tenant’s home where they (and their co-residents) are choosing a provider to enter their home and provide services. Right now there is no right solution. From the SDA market perspective, the SDA & SIL relationship remains a chicken and egg problem. Do you find an SDA provider partner first, and then the tenants? Or do you find the tenants first and then identify an SDA provider? At this stage, we are seeing a wide divergence between providers on how to approach the SDA and SIL chicken and egg. SDA providers are certainly experiencing many positives from partnering with a SIL provider before selecting tenants. It is a more certain pathway to connecting with potential tenants on the SIL provider's waitlist, and brings some expertise and judgement into the tenant selection process that the SDA provider may not have. On the flip side, having the SIL provider involved early limits tenant choice and control. SIL providers have different areas of expertise and some have preferences to work with participant tenant groups. All these factors reduce the potential pool of tenants, which is a serious issue for providers given that vacancy risk is the single biggest concern in the minds of most Board and Executives overseeing SDA ventures (as well as their financiers!). However the relationship is structured, and whenever it begins, delivering effective SDA projects relies on both SDA and SIL being successful. Building SDA properties without a viable model of delivering support is a recipe for disaster. 2017 was the year of governments taking a “wait and see” approach to the SDA market. 2018 will be the year governments begin to respond to the market challenges. The establishment of the NDIS Quality and Safeguards Commission will be accompanied by a dedicate set of SDA Practice Standards. The government’s Quality and Safeguards Framework identified SDA as a specialised area that would need dedicated standards in the new NDIS registration system. These standards have not been publicly released yet. But given the Quality and Safeguards Commission begins on July 1 2018, they will need to be announced very soon. The Disability Reform Council (Commonwealth and State Disability Ministers) took the NDIA to task on SDA in November 2017, agreeing on a program of work for the NDIA to provide the market with more information and a review the SDA framework. The Commonwealth Department of Social Services recently announced that this review will be brought forward. Will the review lead to a change in SDA pricing? Who knows? But the NDIA’s senior executive certainly think not. The NDIA Executive has said “it would be very short-sighted to change a policy where we still don't have the supply”. The NDIA announced that McKinsey has begun a piece of work to explain the SDA policy to the market. This is less a change in policy and more a piece of market information. The NDIA has stated that McKinsey is consulting with the sector on the SDA market information gaps, and will release this by the end of March 2018. This was recently pushed back to the end of April 2018. Victoria and NSW have been the first two jurisdictions to begin to align state tenancy law with the SDA policy. Victoria completed its review of SDA rights in 2017 and NSW kicked off 2018 with their review. The approaches taken by Australia’s two biggest states are likely to inform other state’s decision-making. Fortunately, both Victoria and NSW have focused their questions and principles on giving SDA resident’s similar rights and obligations as everyone other Australia in rental housing. This is a big step forward from the paternalistic and rights-eroding position that many people with disability found themselves in prior to the SDA. Let's hope that States can deliver on their commitment to give people with disability the same residential rights that all Australians have come to expect. Where does this all lead us to with SDA? 2018 will be a big year for SDA. There will be announcements aligning policy loose ends that are well overdue (e.g. tenancy law & Quality and Safeguards). There is also the potential for more significant changes through the Framework review - although the scope and Terms of Reference for this are not set yet. In many ways, 2018 is a do or die year for SDA. The window for the SDA policy to prove itself is fleeting. If construction isn’t commissioned in 2018, delivery is unlikely to occur before 2020. If we get to 2020—4 years into the SDA policy— and the market hasn’t responded with the scale of housing needed, we can expect a lot of pressure on the Ministers to go back to the drawing board. Newer PostAre You An Insider?